Already the man to beat at the Isle of Man TT, John McGuinness reaffirmed his dominance of the event in 2009. In the Superbike race he claimed not only his 15th TT win – putting John second behind Joey Dunlop in the list of most TT victories – but also set a new outright lap record around the 37.73-mile Mountain course. But there was more to come. 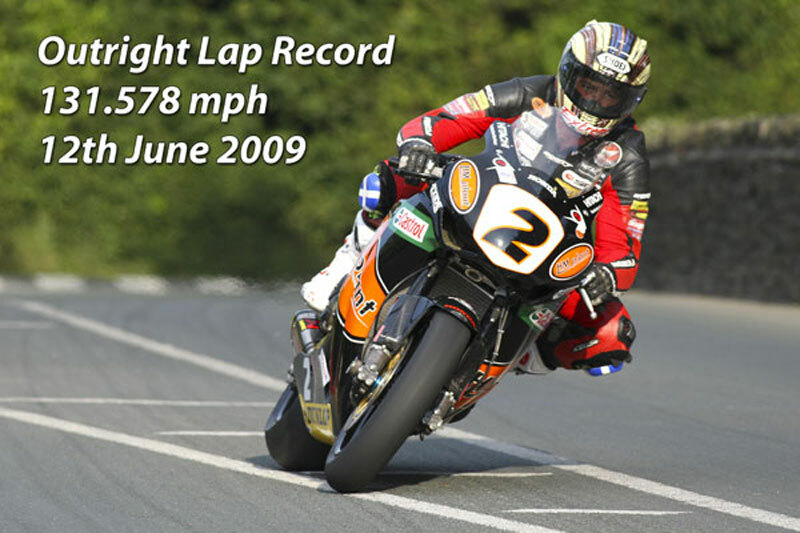 On Friday, June 12th, 2009, during the Senior TT race, McGuinness took his 1000cc HM Plant Honda Superbike around the circuit at an AVERAGE speed of 131.578mph, smashing the lap record he had set just four days earlier and making him the first man to set an Official Outright Lap Record in excess of 131mph at the TT. It was an historic moment, soured only by his retirement from the race with a broken chain while in a commanding lead. Despite that disappointment, however, this was a moment to savour, and this wonderful image, complete with details of this staggering record lap, is a wonderful celebration of McGuinness and his remarkable achievements.